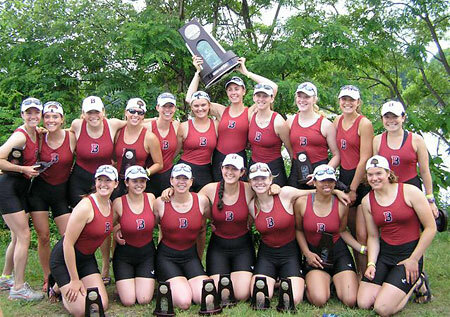 COOPER RIVER, N.J. — Bates College had its best showing ever in the NCAA Division III Women’s Rowing Championships, claiming second place in both the team standings and in the Grand Final in convincing fashion on Saturday. Both of Bates’ two boats fared the best they ever had in this, the Bobcats’ third (and third straight) appearance at NCAAs. It is also the best showing by a team ever at an NCAA championship. The Bobcats’ first varsity boat placed second in the Grand Final to rival Williams, which claimed its fourth straight NCAA title, 6:28.04 to 6:30.77. Although Williams was in first place at each of the 500-meter splits, Bates had the lead down the stretch before the Ephs made a final push across the finish line. Over the second half of the race, Bates I surged past rival Trinity I, ultimately defeating the third-place Bantams (6:36.03) by more than five seconds. Rounding out the field were Ithaca I (6:39.16), Williams II (6:42.00) and Puget Sound I (6:47.47). Bates’ previous best finish in the Grand Final was third place in 2007. Just before the Bobcats’ performance in the Grand Final, the Bates II boat went a long way to ensuring a place ahead of all teams but Williams, outrowing Trinity II in the final 500 meters to claim an impressive third-place finish in the Petite Final. Bates II finished the course in 6:53.73, impressively close behind the No. 1 boats of Smith (6:47.12) and St. Lawrence (6:51.75), and more than three seconds and half a boat length ahead of rival Trinity II (6:57.17). The Bates second boat’s performance far outdid last year’s entry, when it placed second in the Third Final. Four Bates seniors plan to walk at Commencement back on campus in Lewiston tomorrow morning at 10 a.m.: captain and three-time All-American Nicole Ritchie (East Dummerston, Vt.), captain Caitlin Murphy (Duxbury, Mass. ), Emily Chandler (North Yarmouth, Maine) and Laura Hubbell (Yarmouth, Maine). Bates I guaranteed itself a spot in the Grand Final on Friday morning in the opening heats of the NCAA Division III Women’s Rowing Championship, as the Bobcats’ first varsity eight easily won the second of three preliminary heats. Bates I finished the 2,000-meter course in 7:06.90, more than 13 seconds ahead of the second-place boat, Puget Sound I. Bates II, by chance, was in the same race and finished fourth in 7:20.44, just a hair behind Trinity II (7:20.23) for a spot in the Grand Qualifier. Bates II was one of seven boats competing in the Petite Qualifier at 2:30 p.m., where the top three finishers advance to the Petite Final. Bates’ second boat won that race, rowing the course in 6:53.27, more than three seconds faster than runner-up Ithaca II (6:56.47). The win put Bates II in the petite qualifier Saturday at 11:15 a.m.
Bates I was one of three boats guaranteed a spot in the Grand Final. Familiar rivals Williams I and Trinity I were the other boats that qualified for the Grand Final with preliminary heat race wins. See the Bates at NCAA Women’s Rowing Championships preview story. The Bobcats are led by senior three-time All-American and captain Nicole Ritchie (East Dummerston, Vt.), sophomore All-American Rebecca Waldo (Dracut, Mass.) and senior captain Caitlin Murphy (Duxbury, Mass.). Also on the first varsity eight boat are senior stroke Emily Chandler (North Yarmouth, Maine), first-year Haley Sive (Glenville, N.Y.), sophomore Rebecca Waldo (Dracut, Mass. ), sophomore Emma White (Bainbridge Island, Wash.), senior Laura Hubbell (Yarmouth, Maine), junior Danica Doroski (Wayne, Pa.) in the bow and sophomore Nora Collins (Kensington, Md.) at coxswain. The Bates second varsity eight at New Englands consisted of sophomore stroke Kirsten Laaspere (Londonderry, N.H.), sophomore Ellen Patterson (St. Louis Park, Minn.), junior Josie Cutts (Kittery Point, Maine), first-year Elizabeth Sonshine (Short Hills, N.J.), first-year Allison Di Salvo (Lowell, Mass. ), sophomore Phoebe Reed (Brooklyn, N.Y.), junior Alison Frye (Duxbury, Mass. ), sophomore Davina Dukuly (Lowell, Mass.) in the bow and sophomore Tracy Glazier (Weston, Mass.) at coxswain.